After staying silent for months following the announcement in March, a small group of cable companies has started a very public campaign to get people to oppose the proposed purchase of Astral Media by BCE (Bell). 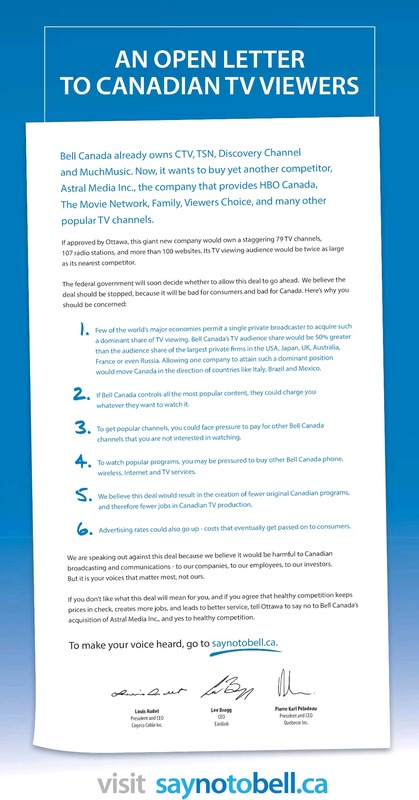 Full-page ads from Say No to Bell (Quebecor, Cogeco and Eastlink) appeared in major newspapers on Tuesday. All that stuff sounds pretty scary. But it’s also a lot of “could” and very little “will”. And the statements seem to ignore that the CRTC has specific rules that are designed to prevent most of the things they worry about. Distributors are not allowed to show undue preference to affiliated channels, and they are required to carry channels owned by competitors (and include those channels in packages where their own channels are included). Specialty channels, meanwhile, are not allowed to charge excess fees, nor refuse to offer their channels individually. That’s not to say there aren’t legitimate worries here. Media concentration wouldn’t be happening if it didn’t result in a significant advantage. Larger companies are more efficient (centralizing paperwork and technology, for example), and even though there can’t be any formal advantage given to affiliated services, it happens in practice. (Cogeco gave the example of Bell’s RDS2, which it said was withheld from it for months until an arbitrator imposed a deal.) There are also advantages to be had in areas the CRTC doesn’t regulate, like online video. Chart of Canadian market share by the Say No To Bell campaign. Quebecor’s name is practically synonymous with convergence and media concentration. It owns the largest private television network in Quebec, the largest newspaper (in terms of circulation), the largest cable company and the largest magazine publisher. It has been scooping up independent weekly newspapers in Quebec as it fights a war with Transcontinental in that industry. And it has absolutely no qualms about using its convergence power across different media. Cogeco, meanwhile, is ill-placed to talk about the negative effects of market share. It was just last year that it purchased Corus Quebec, combining two of the three major players in radio in this province. As if that wasn’t enough, it asked for – and received – an exemption from the CRTC to allow it to own three French-language FM radio stations in Montreal, in addition to an English FM station and a French AM station. Combined, Cogeco-owned stations have a 51.4% market share among francophone Montrealers according to ratings data from BBM Canada. Counting only commercial stations, that market share jumps to 65%. In Quebec City, Cogeco has a 40% commercial market share, nine points more than its strongest competitor. These are the people warning about concentration of media ownership. Perhaps the biggest example of hypocrisy is when Quebecor and Cogeco were asked during the press conference whether they tried to buy Astral. Cogeco’s Audet refused to answer the question, saying it was irrelevant. I take that to mean they probably did try, but lost to the big pockets of Bell. Among those to send their support are charities like the Saskatoon SPCA and Canadian Cancer Society, TV producers like Novem, Groupe Fair-Play and Zone 3, territorial legislators (because of the proposed upgrades to Northwestel) and major advertisers like Loblaws. Let’s hope both regulatory bodies can sort the truth from the BS being thrown at them from both sides. The Financial Post, which says the Competition Bureau is looking into allegations raised by competing cable companies that Bell is abusing its market dominance to impose abusive contracts for its television services. Bell responded to the campaign with a press release focusing on how the acquisition would increase, not decrease, competition in Quebec. The Canadian Media Production Association, which doesn’t oppose the deal but wants a better benefits package for the broadcasting industry. The Parti Québécois, which says it will use the courts and even legislation if necessary to stop the deal. Even though it was days after the deadline for comments to the CRTC, Telus also issued a public statement encouraging a stop to the deal. Telus filed an intervention with the CRTC making a similar call. A poll by Forum Research shows 60% of Canadians oppose the Bell/Astral merger. Is that just a matter of their distaste for large corporate mergers, or evidence that the Say No To Bell campaign is working? Either way, I predict lots more full-page newspaper ads. On Tuesday morning, Cogeco announced that CJTS-FM 104.5, the station in Sherbrooke it was forced to sell as part of its acquisition of Corus Quebec assets, has been shut down because it hasn’t found a buyer. The station, along with two in Quebec City that have found buyers, were under the management of a trustee. The closing leaves 12 people out of work, and Cogeco is not offering them jobs elsewhere. Coverage at the Journal de Sherbrooke, La Tribune and Cogeco Nouvelles. CJTS-FM used to be CKOY-FM, and a sister station of Montreal’s CKOI. When the Cogeco deal closed on Feb. 1, it moved the CKOI format and branding to CHLT-FM 107.7. That station is now CKOY-FM. CJTS picked up the Souvenirs Garantis format, which it held until noon on Tuesday when it shut down. Cogeco’s original plan for the station, which they hoped would satisfy CRTC commissioners, was to turn it into a retransmitter of CKAC Sports. That would have made things interesting when CKAC was turned into an all-Montreal-traffic station. The other two stations Cogeco was forced to sell, CJEC-FM (Rythme FM 91.9) and CFEL-FM (CKOI 102.1) in Quebec City, were sold to businessman Jacques Leclerc. UPDATE (Dec. 15): Quebecor’s Pierre Karl Péladeau confirms (after Agence QMI somehow managed to “learn” about it) that Groupe TVA submitted a bid to buy the station. Normally the CRTC doesn’t allow the same company to own a major newspaper, a TV station and a radio station in the same market. Quebecor does own a weekly, the Journal de Sherbrooke, but no daily paper there, which I suppose Quebecor would use to argue it should be allowed to own it. Still, it would have been the media giant’s first radio station. Cogeco wouldn’t confirm it, because such bids are confidential, but it says no bids met the criteria set by the liquidator. It would be interesting to see which one it didn’t meet. Two weeks after the Canadian Radio-television and Telecommunications Commission issued a decision that awarded licenses for two new AM radio stations and rejected two others for lack of available frequencies, the two groups who had applications rejected are studying their options. Metromedia (owned by Cogeco Diffusion), which in September launched a French-language all-traffic station on CKAC 730, had its application for an English station on 940 kHz rejected because “the Commission is not satisfied that the proposed service would represent the best use of a high-power AM frequency in Montréal,” and the group said it would not accept the other frequency that was available as part of the hearing, 990 kHz. Still, the commission suggested Cogeco reapply for another frequency. Now Cogeco is planning what to do next. Mark Dickie, who is the general manager for CKBE The Beat and part of the committee planning the anglophone traffic station, said he’s been in regular meetings since, but no final decision has been made on whether to reapply. Another meeting is scheduled for Tuesday. There are many factors that suggest Cogeco will reapply for another frequency despite its earlier assertion that only a clear channel would work. For one thing, the station is part of an agreement between Cogeco and the Ministry of Transport, which would pay the broadcaster $1.5 million a year to operate the station. Though the agreement requires the station to have coverage around the Montreal area, how that’s determined is not clearly defined. A similar agreement governs the French all-traffic station, which is also worth $1.5 million a year for Cogeco. Because the agreements are the same for both languages (meaning their value is based on the cost of providing the service, not the potential audience) and because there are no guaranteed minimums in terms of audience reach, it’s clear the ministry doesn’t actually care how many people listen to the station, just that it’s there. Guilaume Paradis, spokesperson for Transport Quebec, told me they are awaiting another submission from Cogeco, and that “we will study it,” but that they still want to see an English all-traffic station in Montreal. When asked about specifics, Paradis said that they are not experts in radio broadcasting, which is why they hired Cogeco to do the job in the first place, and they will leave the details of how such a station would reach the Montreal area to Cogeco. The agreement between Cogeco and the government originally called for both stations to be operational by Oct. 31. That was amended with a new deadline of Feb. 29 in light of the elongated CRTC process. Clearly that will need to be amended again if the project is to continue. The other group, 7954689 Canada Inc., known as Tietolman-Tétrault-Pancholy Media, scored a half-victory at the CRTC, getting clear-channel 940 kHz for a French-language news-talk station, but the English station was rejected for lack of available frequencies (like Cogeco, the TTP group rejected 990 as an option). One of the group’s partners, Paul Tietolman, originally wouldn’t comment on their plans, but now says the group will make an application for another frequency. He wouldn’t say what frequency that is, but did suggest it would be a unique technical setup (perhaps not limited to one frequency or one transmitter), without going into details. Tietolman said many people have already approached the group expressing an interest in joining them. They are currently in the process of setting up their management team, who will then hire talent. He said the goal is still to have the station running by fall of 2012. Asked whether the group is sticking to its stance that it would not proceed with a radio station in one language without getting approval for the other, Tietolman would say only that he expects everything will work out, and that a solution has been found that will make everyone happy. Meanwhile, the group has applied for an FM radio station in Calgary, one of 11 applications for FM stations on a few remaining vacant frequencies in that city. The application is for a music station that would be based on current and classic hits (from Katy Perry to the Beach Boys), based on requests, and with commitments to promote emerging Canadian artists as well as comedians. It would also hire 12 journalists and have newscasts 24 hours a day. Tietolman said other applications are coming for other cities. The two other applications, TTP’s English-language news-talk station and Cogeco’s English all-traffic station, are denied, not because the CRTC feels they are without merit, but because the other applicants made better cases for the two clear-channel frequencies and neither would accept 990 as a backup. The CRTC hints that the two might be approved if they reapplied for other vacant AM frequencies (like 600 or 850), but that these applications would have to be reconsidered on their own merits. Also Monday, the CRTC denied four applications for low-powered AM radio stations in Montreal, three of which would target ethnic communities and the fourth a religious station. The CRTC felt they would negatively impact the five existing ethnic stations, notably CKIN-FM 106.3 (Mike FM’s sister station), which has programming targeting the South Asian and Latin American communities, and religious station Radio Ville-Marie (CIRA-FM 91.3). The second decision has an impact on the first, in that one of the stations had applied to use 600 kHz. The denial of that application means the frequency is available to the big commercial players. Tietolman-Tétrault-Pancholy has hinted that it might be interested in that frequency, provided it can use a tower or get space for one to build themselves. The only one capable of doing that frequency right now is Cogeco’s towers, which will continue to go unused, but Paul Tietolman says he has no intention of asking Cogeco for them. You can read a summary of what’s going on in this article I wrote for Tuesday’s Gazette. Below, I go into a bit more analysis. CKGM’s frequency change clearly made the strongest case, because it was an already-existing station and because moving it would offer another frequency for another applicant. (The CRTC likes to make as many people happy as possible.) Its content – sports – is also better suited to a signal that carries farther into the regions. So CKGM wins the biggest prize, 690 kHz. Tietolman-Tétrault-Pancholy’s application was taken seriously, and the CRTC believes enough in its business plan that it is willing to give them a chance. But it wasn’t going to give the one applicant both clear-channel frequencies. So TTP gets 940. And since they said they would not accept 990, one application has to be denied. The French market is stronger in Montreal and its surrounding regions, and there isn’t as much direct competition for a French news-talk station as their is in English with CJAD, so the French station gets approved. Cogeco’s application for an English all-traffic station couldn’t convince the CRTC that it required a signal so powerful that it can reach into Gaspé. They made a valiant effort, saying that they need to be heard across the Ontario border for people who commute from that far, and that their application should be approved because otherwise the existence of the French all-traffic station would create an imbalance in services to different languages. But the CRTC remained unconvinced. And since Cogeco wouldn’t accept anything but 690 and 940, that application had to be denied. Dufferin’s Radio Fierté gets 990 more by process of elimination than anything else. Two applications were approved for clear channels, and the other two wouldn’t accept 990, so Dufferin gets it. That isn’t to say the CRTC wasn’t excited about their application and eager to increase the diversity of the radio industry in Montreal. But it seems pretty clear that if TTP would have accepted 990 for its English station, it probably would have gotten it. One thing I like about the CRTC decision is that it calls a lot of bluffs from the applicants. Cogeco went all in, saying it’s 690, 940 or nothing. I find it hard to believe they’re just going to walk away from $1.5 million a year, and their deal with the Quebec government was already modified once when they decided to make CKAC an all-traffic station. Because that $1.5 million is based on costs instead of audience (otherwise it would be more for the French station), there’s no reason to believe they couldn’t reach a deal for another frequency like 600 or 850. Cogeco’s Mark Dickie told me before the decision that there is no Plan B. If that’s true, they either have to come up with one or walk away from this project. The latter option would be particularly embarrassing because both parties have been acting as if this was a done deal. The government has been advertising a coming English traffic station, and Cogeco has even asked for applications for potential traffic hosts, with only a footnote at the bottom pointing out that these jobs might not actually ever exist. Is Cogeco willing to walk away from $1.5 million a year? Is the Transport Ministry willing to walk away from their promise of all-traffic radio in English? We’ll see. The CRTC also called the bluff of Tietolman-Tétrault-Pancholy, which originally said it wanted both clear channels or nothing, then softened that stance suggesting the English station could find another alternative frequency. They continue to insist that they need both stations for the business plan to be viable, but say the English station might not need to be a clear channel if they can get adequate coverage in Montreal and the West Island. So far 600 kHz seems to be the only one able to do this, but that would require either expanding the site they were planning to use or using Cogeco’s CINW/CINF site in Kahnawake. The latter option is very distasteful to Tietolman and his partners. When I finally reached Tietolman on Monday, he said he wouldn’t comment (other than to point out that TSN said it would be fine with 940, which I guess means TTP felt the CRTC should have given 690 to them and given 940 to TSN). Tietolman said he and his partners are going to study the decision carefully and decide where to go from there. Though nobody’s pointing this out, the CRTC decision combined with TTP’s position should mean that the group will decline the license. I highly doubt that will happen, but if TTP doesn’t get a decent frequency for its proposed English station, or if the application takes too long, they might face the choice of going with just the French station or going home. The big question for the winning applicants is when they’re going to be on the air. Bell Media says it’ll be “within six months” for CKGM, which would mean by the end of May (maybe just before the playoffs start, or just after the Canadiens are eliminated). It’s unclear at this point whether it will operate for any length of time on both frequencies, though that has been the practice in the past. Evanov/Dufferin hopes to have its station up within a year, but has to wait for CKGM to vacate its frequency first. The decision gives the group a second choice in terms of transmission site. It already had a letter showing it could enter into negotiations for use of the CJAD site, but as part of the hearing Bell Media committed to negotiating use of the CKGM site for another station on 990, and even said it would submit to binding arbitration concerning a transmitter sharing deal. Evanov tells me they will look at both possibilities. Over the coming days, I’m taking a closer look at the applications for Montreal’s AM clear-channel frequencies 690 and 940 kHz that were presented at CRTC hearings in October. We’ll start with the first one: Metromedia (Cogeco), which applied for an English-language all-traffic station on 940. It’s a perfectly reasonable argument from the group that first applied to reactivate 690 and 940 AM. The frequencies have been unused since January 2010, when CINW 940 and CINF 690 were shut down. The licenses for those two stations were officially revoked on June 8, 2010. For almost a year, anyone could have applied for those frequencies, but nobody did. So when Cogeco, which acquired Metromedia from Corus on Feb. 1, struck a deal with the Quebec government to setup two all-traffic stations on those unused (and seemingly unwanted) frequencies, there was no reason to think the regulatory step was anything more than a formality. The CRTC originally scheduled the applications to be heard along with a bunch of others in a rubber-stamp hearing (it ended up lasting 15 minutes, with no presentations or questions). But then everyone decided they wanted in, too. Interventions were filed by competitors Astral Media and Bell Media, and would-be competitor Tietolman-Tétrault Media. They demanded that there be an open call for applications, questioned giving clear channels to local all-traffic stations, and in the latter two cases said they would apply for one or both of those frequencies instead. They also pointed out how Cogeco asked for – and received – an exception to the CRTC’s ownership concentration rules by having a third French-language FM station in Montreal, and that another French-language radio station would give them a total of five in this market. The CRTC responded by pulling the two applications from that hearing and issuing an open call for applications for those two frequencies with an Oct. 17 hearing date in Montreal. The call prompted four other applications. Cogeco, whose deal with the Quebec government initially had an Oct. 31 deadline for the stations to go on the air, decided it couldn’t wait for the full process to complete itself, and transformed CKAC Sports 730 into a French all-traffic station on Sept. 6. It subsequently withdrew its application for a French all-traffic station on 690. I asked Dickie why, if Cogeco considered the CKAC shutdown regrettable, Cogeco didn’t maintain its application and either switch the all-traffic station to 690 or put sports on it. He said they felt, in light of the interventions and the concern about how many stations Cogeco owns, that it was unlikely such an application would be successful. For the second consecutive year, the Alouettes have prematurely ended their deal with their official French-language radio broadcaster and switched to its major competitor. It was announced on Tuesday that the Alouettes will be returning to Cogeco’s CKAC Sports for the 2011 season. CKAC will broadcast 20 games (the regular season has 19 18, so this covers all of those and the two preseason games), plus all playoff games. Pierre Martineau, a spokesperson for Cogeco Diffusion, says the deal is for this coming season only, and some games will also air on Cogeco’s regional FM stations. Having CKAC Sports broadcast the games seems like such a no-brainer, and indeed they broadcast the games for many years, signing a five-year deal in 2007. But that deal was mutually dissolved so that the Alouettes could strike a deal with Astral Media’s NRJ for broadcast rights in 2010. That deal was supposed to last until 2013. The switch to NRJ wasn’t perfectly smooth. NRJ is a music station (like CHOM, which also broadcasts some Alouettes games), and license limits meant they couldn’t broadcast five games last season, according to La Presse. Fans also weren’t crazy that NRJ used the RDS play-by-play audio instead of their own staff, though CKAC did the same thing. A representative of the Alouettes did not immediately respond to voice mail messages requesting comment. The Alouettes’ English radio rights are held by Astral, with games airing on CJAD and CHOM until 2013. It’s unclear if the move away from Astral on the French side will have any impact on the English rights. No doubt the Team 990 would be more than happy to pick up rights to Alouettes games, much like they would love to take rights to Canadiens games away from CJAD someday. Last month, CKAC announced an agreement to air Canadiens games for two more seasons, ending in 2013-14.